The former Bellator Champion beat Rousimar Palhares in dominant fashion this past Saturday night at UFC on FX 6. Lombard used a variety of power punches to end the bout at 3:38 of the 1st round. With an impressive victory like that against an always aggressive Palhares, Lombard should face someone in the top 10 of his weight division. Lombard could face Mark Munoz next to see where he belongs in the UFC 185 pound division. The former IFL Heavyweight Champion, looked outstanding on his feet at the Ultimate Fighter 16 Finale against the much larger heavyweight Matt Mitrione. Nelson won the fight via TKO at 2:58 of the 1st round. Nelson has expressed interest in Pat Barry for his next heavyweight challenge. Both men are heavy handed and love to stand and trade leaving this a true fight for the fans. Chad “Money” Mendes won his UFC on FX 6 bout in 1:55 in the 1st round against Yaotzin Meza. Money has put together two very impressive wins since losing via KO to current Featherweight champ Jose Aldo (21-1). A number one contender matchup between Chan Sung Jung (13-3) and Mendes would make for an outstanding war between the featherweights. The winner would face the victor of Jose Aldo and Frankie Edgar (14-3-1) whom are set to face each other at UFC 156. The Diamond showed his true heart and resilience in his bout at the Ultimate Fighter 16 Finale against Jonathan Brookins (13-6). Poirier came back from behind and submitted Brookins via Brabo choke 4:15 in the 1st round. The Diamond, looking to work his way into the number 1 contender status, could face the winner of Erik Koch (13-1) and Ricardo Lamas (12-2) when the two are set to face each other at UFC on Fox 6 in January. 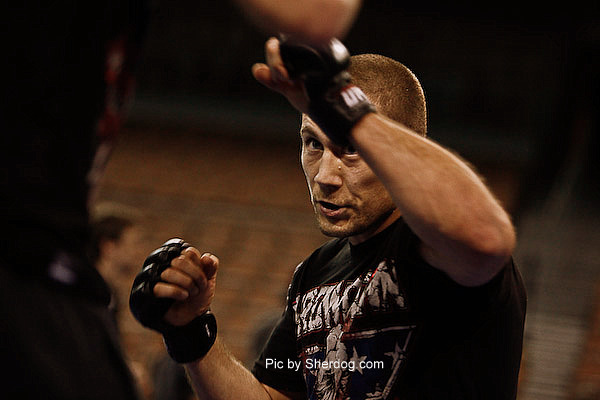 Mike Pierce looked dominate in his unanimous decision victory over Seth Baczynski at UFC on FX 6. Pierce is a strong contender in the UFC welterweight division only losing to the likes of Jon Fitch (24-4), Johny Hendricks (14-1), and Josh Koscheck (17-6) since joining the UFC in 2009. Mike Pierce just may be the perfect person to welcome the Strikeforce Welterweight Champion Nate “The Great” Marquardt (32-10) back to the UFC. Mitrione stepped in on short notice to face Roy Nelson (18-7) at the Ultimate Fighter 16 Finale. Mitrione was stopped by Nelson 2:58 of the 1st round. Mitrione has been away from the octagon for almost a 14 month layoff and now riding a two fight losing streak. Todd Duffee (7-2) and Philip De Fries (9-1) are set to face each other at UFC 155; Mitirone could face the victor of this fight. Watch Dustin Poirier and Pat Barry finish their opponents in the video below.